There’s nothing like January in New England to inspire a person to be a little over-serious. Serious is good too, but it’s nice to remember things like the following, as well. 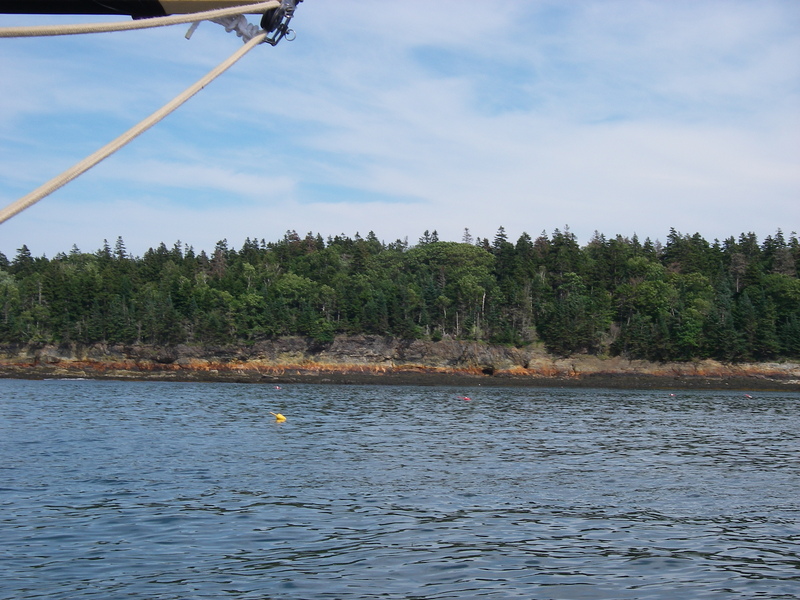 Jewel Island is in Casco Bay, which is the first big bay as you go north and east along the coast of Maine. It’s the one that has Portland within it, and South Freeport, with L.L. Bean, and the Harraseeket River, with my favorite seafood chowder anywhere. 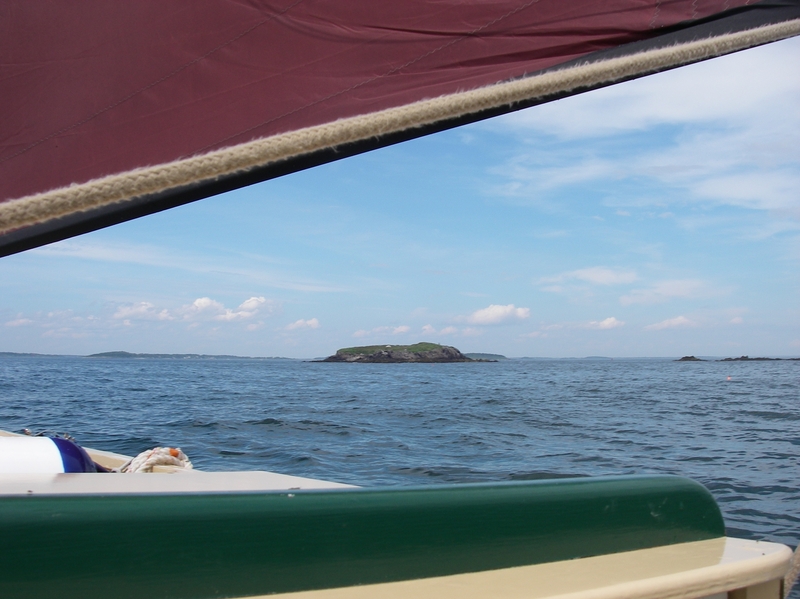 Casco Bay also has zillions of islands, ranging from protected and close-in to the mainland shore, to those on the outside, bordering the open ocean. 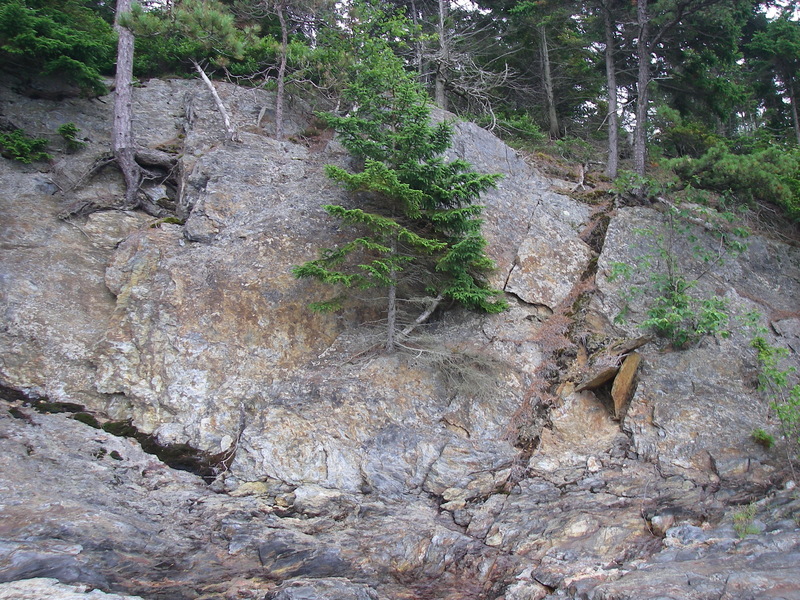 Jewel Island is one of those on the outside edge of the bay, and is one of my favorite places, anywhere. For starters, nobody lives there. 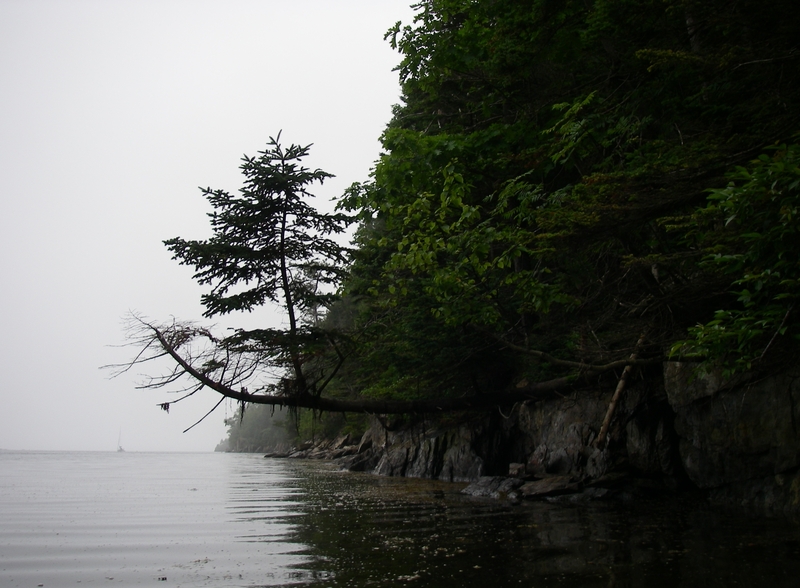 The entire island is conservation land, open to the public, with a lovely network of trails, and numerous campsites along the shore. And it has a fantastic harbor, protected from most directions. All of these attributes make this spot enormously popular with a whole bunch of people besides me, and this can be a challenge. When I arrived in 2013, on a beautiful day, there was a lot happening there already. 10 or 15 boats were in the harbor, with camping groups going back and forth from boats to the shore, beer in hand. As the afternoon went on, more boats arrived. 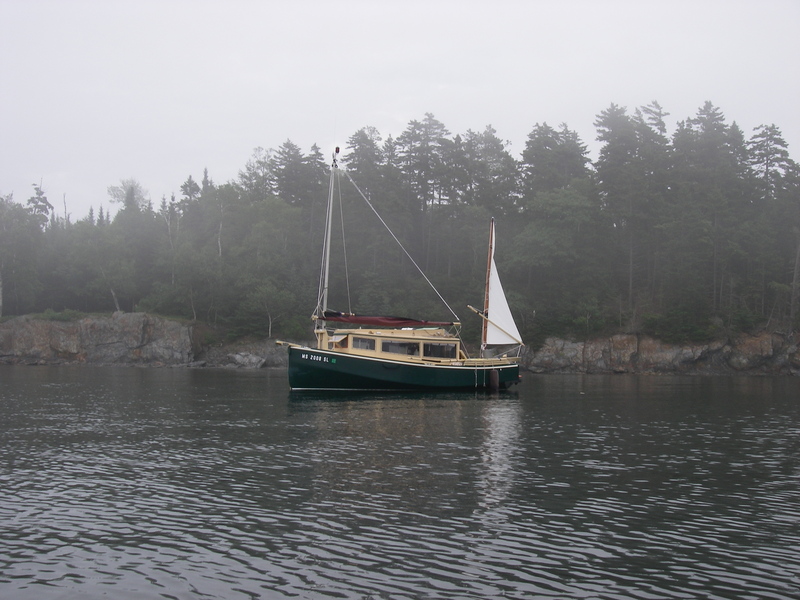 On the bright side, everybody is in a good mood, and some fascinating vessels come and go, including everything from enormous and elegant sailboats, mixed in with the more predictable plastic, to a couple who rowed the long way out in a home built dory. There are campfires on the bluff along the shore, and folks to laugh with about how cold the water is, when they come by as you swim around the boat, rubbing algae off the water line. It gets quieter after dark, and in the morning the crowd begins to thin out. The grand social event is fun, when not overdone. This time around, I had the great blessing of impending wet and foggy weather. By the next evening almost everybody was gone, and by the day after that I was the only one there. The harbor is not well protected from the northeast, but this storm very kindly came from the south, and gently, leaving me perfectly snug. Between showers I paddled around in the packraft, touching rocks, and the needles on overhanging trees. Eventually I acquired a neighbor, and then the weather cleared. My next stop was the Harraseeket River, and that lovely chowder, along with a meeting for shore support. People talked about how bad the weather had been, but it seemed to lift their spirits when I said how incredibly happy I had been having Jewel Island all to myself, as a result of all those days of rain and fog. I would do it again in a flash, just that way. Lovely! I’m of your way of thinking about society and solitude. That’s a nice way to do it, an intentional touring of the coast. You’re in for a treat, if you go up past Boston. All the way around Cape Ann is incredibly beautiful, including both the inside route through the Annisquam River, and the outside by way of Rockport. 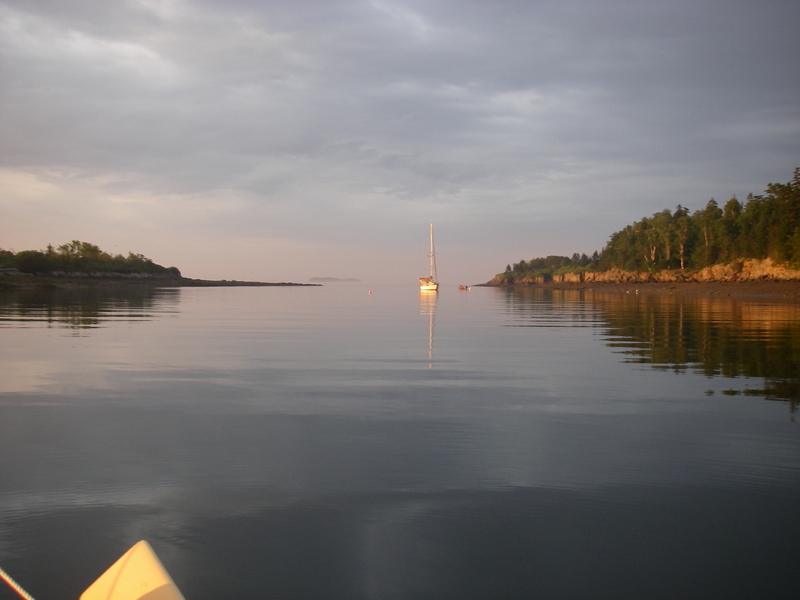 Your boat would be outstanding for the bays on the north side of Cape Ann, threading among the sandbars, or over them, at high tide. Extraordinary birds, and the passages in and out of the bays are quite doable, if you watch the tide tables, and opposing winds. Then some people beach the boat on the inside and hike over the dunes to the outer beach. It’s pretty special. Shemaya, I love the pictures throughout the post. Wonderful shots of the area. What really has me scratching my head is how late you were up writing this one! Thank you for telling the story. So glad you enjoyed the photos (and story). That evening when this post went up was late for me, but not as late as it looked – I never changed the blog time after daylight savings ended, and apparently it doesn’t do that by itself. Saturday night party was staying up until after *nine*, playing with the computer!